Voice recorders have been used from a very long time. Earlier, a separate gadget is used to record voices and it renders no other services. But you can replace those good for one thing voice recorders by the voice recorder apps on your smart phones. 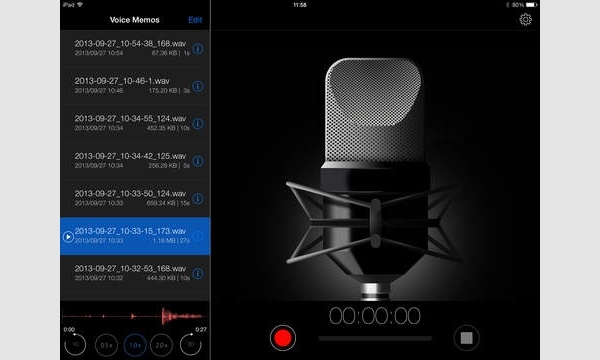 You can easily choose amongst the various Voice Recorder apps available for you on the App Store. You can not only record music, voices, etc. but can also record your voice calls without any hassle with just a single app on your iPhone or iPad. You don’t have to carry any other device, these voice recorder apps offers you more than just voice recording. 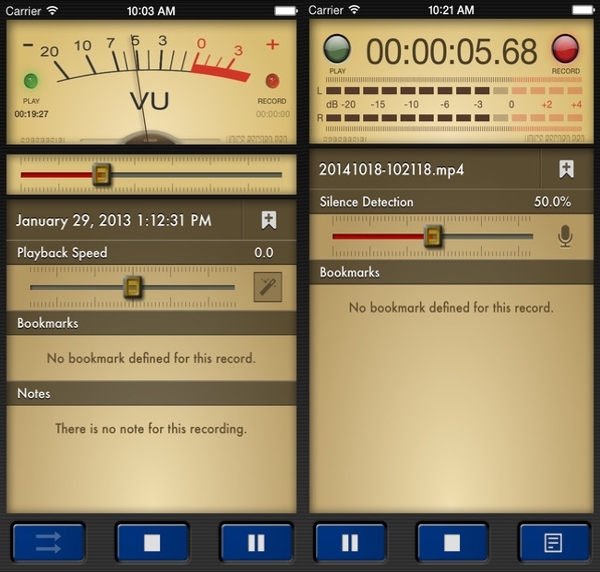 It is one of the leading voice recorder apps for iPhone and iPad users. This app provides you a simplified and instinctive user interface. You don’t have to worry about the storage or sound quality because you can easily select amongst the given levels of sound quality. It also works in the background, set and forget it. You can also share your recordings to your email via iTalk or PC over a strong Wi-Fi connection. Easy sharing to PC and email. Work as a background app also; simple, and easy to use. Sound quality can be altered. It is a voice recorder app for the professionals. 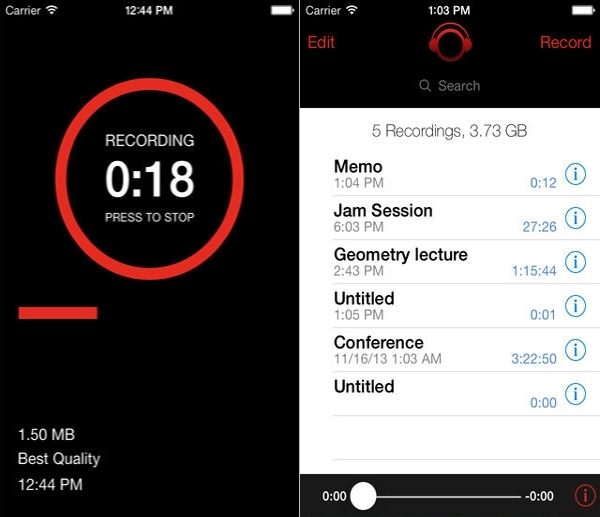 You can record sounds and memos for unlimited size and length with customizable sound quality. You can choose from the various voice formats like AAC, MP4, M4A, MP3 and WAV. You can easily transfer your recording and memos to your Drive, DropBox, One Drive and other storage devices. It also lets you post and upload the recording to social media. Easy transfer and storage to Drive, DropBox, One Drive, etc. Sound recording in various formats like MP3, MP4, M4A, WAV, MPEG, etc. It is one of the best voice recorder apps for all the people that are regular users of voice memos. It is designed for professional use. You can purchase the app from the App Store by paying 1.99 USD. 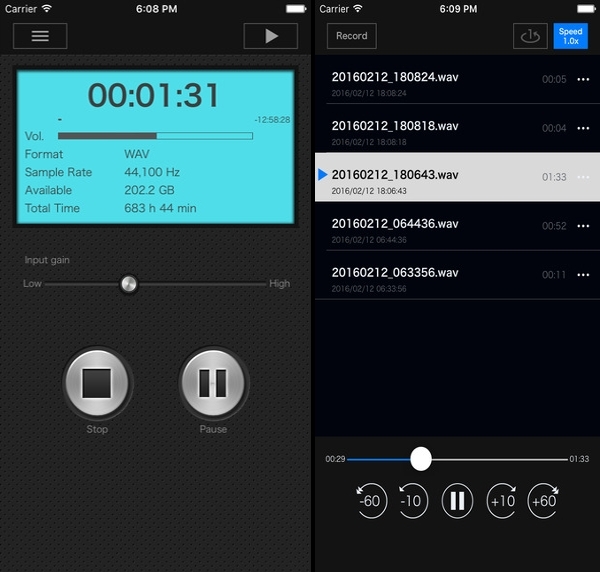 The Voice Recorder HD app is also supported on the Apple Watch. It has sleek and intuitive user interface. The app provides you high sound quality voice recording. It has additional features like Bluetooth Recording, Background Recording, unlimited time recording (tested up to 21 hours), and much more. 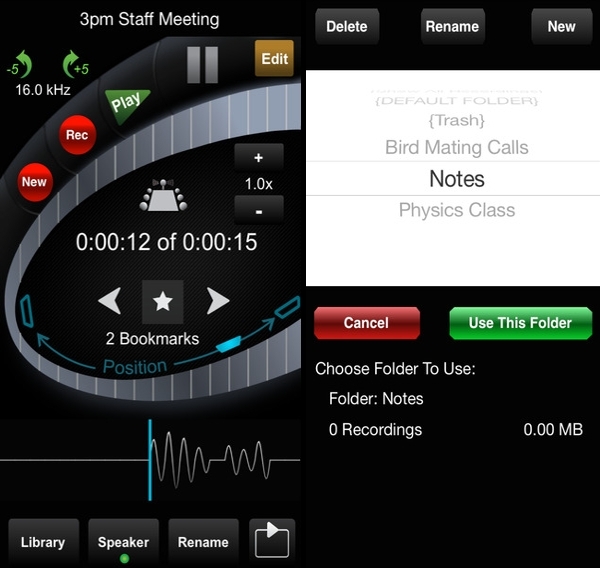 The best professional app for voice recording in lectures, business meetings, conferences, etc. You can record from a distance also. 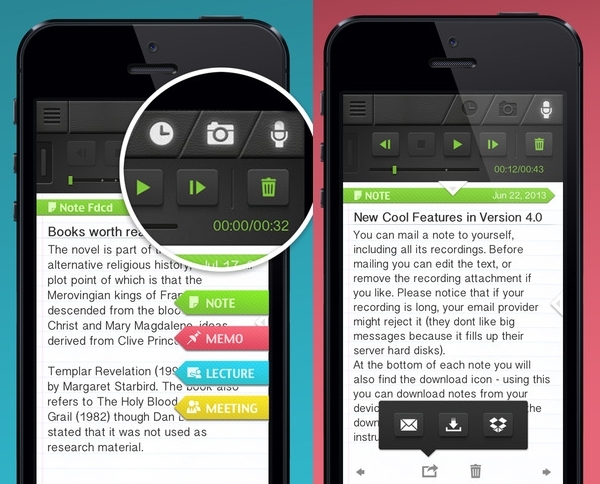 The app offers feature to take note while the recording is in progress in the background. Highly sensitive to sound and thus can record even slightest whispers few feet away. It skips silence during a recording automatically. You can also bookmark important moments in the recording and can review them later. Easy transfer to email as attachments and it splits big files into multiple attachments automatically. This app is designed for the journalist that requires ENG style cameras with internal time code. Easily calibrated with the camera timing and is easy to use. The app provides the personnel to write the script immediately after the recording is saved which saves the time of the journalist. It offers features for easy saving options and transferring your recordings to the DropBox. The Pro version of the Q-Recorder provides you additional features which can easily share, rename and do much more with the recording. 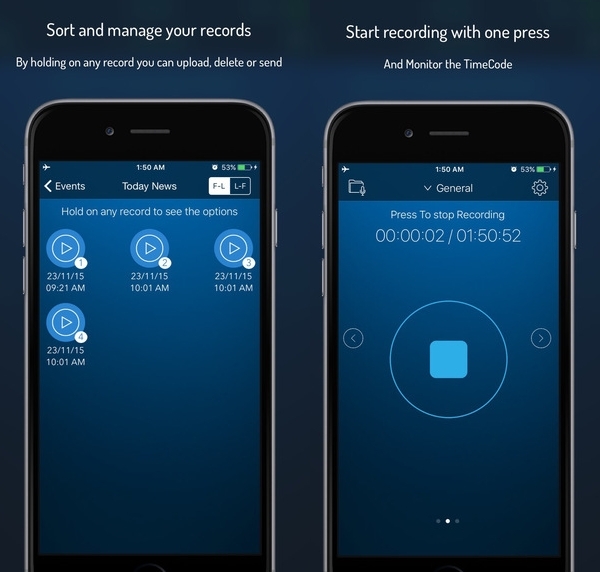 These are some of the best voice recording apps for iOS.